Call it what you will…buffet, sideboard, credenza…these beauties are not only super stylish pieces of furniture, but also majorly functional. They provide storage, a place to display a delicious dinner spread, and a great way showcase your style. What more could you want? Maybe a step by step guide on how to design one like a pro? You got it. First off, you’ll want to be sure that the sideboard you select suits both your style and the size of the space. It’s a common mistake to select a piece that is too small for the wall that it is on. I see it alllll the time. 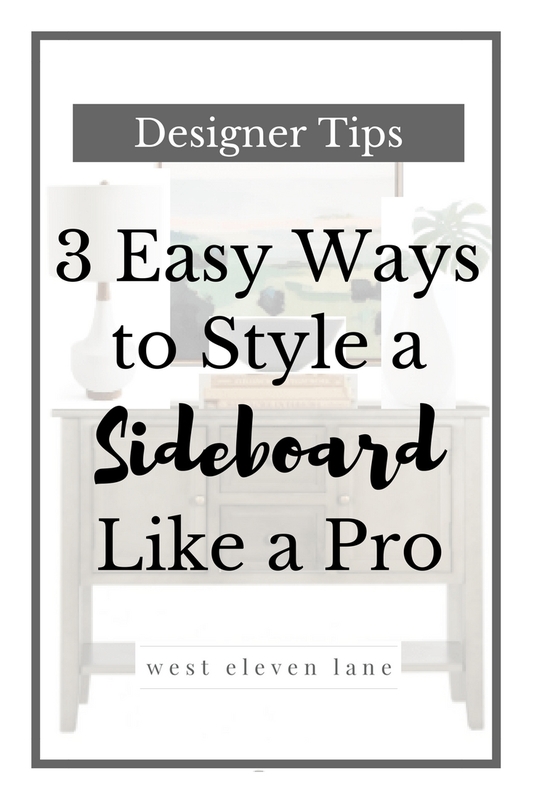 Use my painter’s tape trick to mark off measurements prior to purchasing your sideboard to be sure that you have the right fit. From here, it’s time to get down to styling. Step 1: Select a mirror to anchor the piece. Keep in mind that the center of the mirror should hit around 58″ off of the ground. I like to see the bottom of the mirror fall between 6-8″ from the top of the sideboard. This will give you an idea of the general size mirror you should select. Step 2: Bring in symmetry and color with like lamps on either side. I personally like my lamp shades to hit somewhere around 2/3 of the way up the mirror. Step 3: Add interest by bringing in a collection of various sized pieces. Here, I have used found frosted glass vases of varying sizes and I think they finish off the look nicely. Step 1: Select a piece of art to anchor the sideboard. Keep in mind that the center of the artwork should hit around 58″ off of the ground. I like to see the bottom of the art fall between 6-8″ from the top of the sideboard. This will give you an idea of the general size artwork you should select. Step 2: Add functionality with a lamp on one side, and balance it out with a similar object such as this vase with greenery. It is common for designers to keep the left hand object a tad higher as it typically is more pleasing to the eye. Step 3: Finish off the look with a stack of hardcover books (binding side out) and an object of interest on the top. Here, I have used a bowl, but you could also use a decorative object, a large shell or small potted plant. Step 1: For this example, you can put your drill away because we are simply leaning artwork against the wall. Select a taller piece of artwork to start. Select a smaller piece to lay in front, and play around with horizontal or vertical positioning to see what looks best. Step 2: Bring in a tall item on the left. Here, I have used a decorative vase, but you could also use a lamp, a lantern, or a candlestick holder. Step 3: Finish off the look by bringing in a collection of three small, similar items. Here, I have used a set of metal sculptures, but you may want to bring in objects of interest from a collection that you own or candles, for example. Are questions coming up as you have a go at it? Leave a comment below so I can help!